I got audited by the state of Massachusetts, USA, due to a mistake I did when filing my 2015 Form 1 (mirror). The audit's conclusion was that I have to pay 1000 USD to Massachusetts, and in addition 150 USD for interest. I am filing a dispute, where I claim that Massachusetts owes me 50 USD. What should I write in the "Total Adjustment Requested"? Browse other questions tagged united-states state-income-tax massachusetts audit dispute or ask your own question. Is there a dollar amount that, when adding Massachusetts Sales Tax, precisely equals $200? Is Tax Audit Protection insurance worth the money? 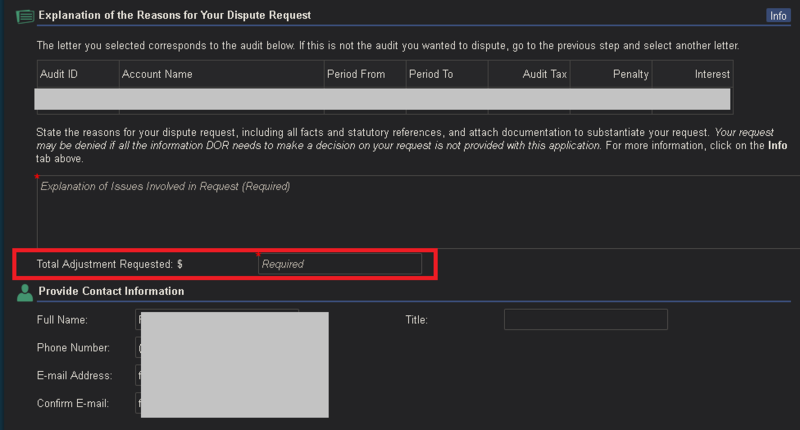 How can I escalate a credit dispute when the bureau “confirms” the item?